Ad of the Week: Tops! I can’t embed the video, so here’s a link to Fred Astaire performing “Top Hat, White Tie, and Tails.” Glenmore, I believe, was another product of the Medley distillery. 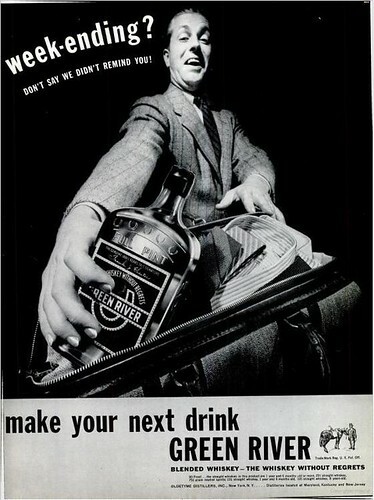 A while back, I posted several ads for Green River whiskey. At the time, I mentioned that the brand was defunct, but that the distillery that made it–the Charles Medley Distillery–was again operational. I was wrong, and I was right. The Medley distillery is again operational, but Green River is no longer defunct. Rob McCulloch–great-grandson of Green River’s founder, John McCulloch–has revived the brand and is again making Green River whiskey, as he noted in a comment on the original post. The Medley distillery is closely linked to three Kentucky distilling families: the Medleys for whom its now named after, the McCullochs, and the Wathens. It’s this latter family that gave its name to another current product of the Medley distillery: Wathen’s Kentucky Bourbon. I believe I’ve seen Wathen’s for sale in Rhode Island, so I’ll have to try a bottle. I’d be interested to know whether the new Green River is a straight bourbon whiskey or a blend. I’d hope for the former. 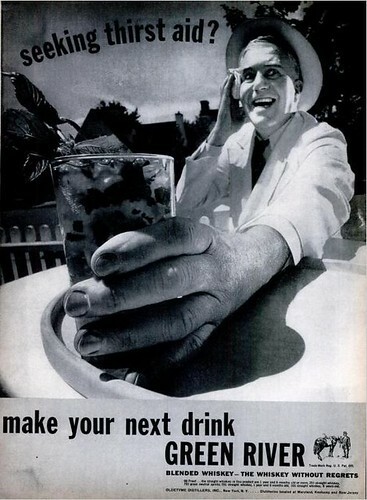 Welcome to Mixology … uh, Wednesday? Okay, I’m well behind this time, but what the hell, right? The theme this month is Brown, Bitter, and Stirred, and it’s hosted by Lindsay Johnson of Lush Life Productions. Lindsay, it turns out, has a standing order she uses when walking into a bar; it’s this month’s theme, and I think it speaks for itself. Equal parts, in my case 1-1/2 ounces apiece because I’m a lush. Brown, bitter, stirred. That Lindsay’s pretty smart.